Real estate is a big and often lucrative business. The reason is fairly simple. Because they build at scale, developers enjoy financing, purchasing and construction discounts individual homebuyers do not. For example, a developer can get favorable financing on a loan for a ten story building because banks like the large sums of money involved. A developer can purchase the building for 10-30% less than if the units were purchased individually. And the developer can renovate or build the units for 10-30% less than one-offs. Once the building is ready, the developer sells the units with that 10-30% (or more) tagged on. Thus a fortune is made (or, on occasion, lost). But what if individual homebuyers could pool their money together to finance, purchase and construct a building they were going to inhabit? What if you and I could be real estate developers? This is the idea behind Baugruppens. Baugruppen means “building groups” in German. Folks–often friends–get together to finance, purchase, design and construct the buildings they will eventually live in. They are the developers. The advantages over traditional development are many. Beside the obvious and significant savings, units can be designed around individual owner needs. And because the groups are often formed by friends and family, there’s an instant community formation, abetted by the building designs which often include common spaces. 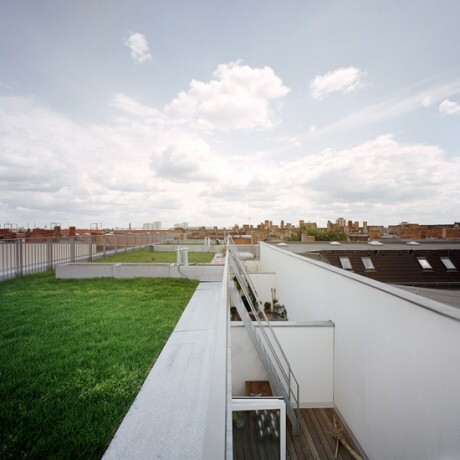 Baugruppen, unlike cohousing, which tends to be a grouping of single family houses often in the burbs, are multi-story, multi-family buildings, located in cities (Eliason likens them to condos). If you’re interested in the typology, you should definitely check out The Urbanist’s Mike Eliason’s seven part series on Baugruppens. 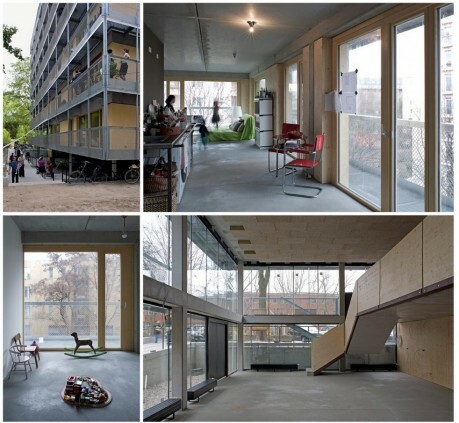 What the series shows–and this is not to rag on American cohousing–is the premium Germans place on design. Many of the buildings have incredible interior and exterior spaces–designs that are both modern and timeless. Many are built to rigorous efficiency standards such as net zero and Passive House. Baugruppen surely experience the same unsavory aspects of real estate development that normal developers do: cost overruns, design disputes, depreciation, etc. But at the end of the day, a Baugruppen member, even if he or she has lost money or taken more time than expected, will have a house to live in. Unfortunately, Baugruppen-type development is a non-starter in the US, where FTC regulations limits large scale real estate investment to accredited (see wealthy) real estate investors. But if this were to change, this type of development could provide homeownership opportunities for people being priced out of their cities. Take Manhattan for example, where the current median selling price of a home is $980,000 (NB: almost half of home sales are all cash). Compare that to the 2013 median household income in Manhattan of $72,190. If people could leverage their collective purchasing power and cut home prices by 10-30%, it’d still be ridiculously expensive, but perhaps attainable to far more people than the present situation. Let’s hope. I cannot imagine that many people coming together and agreeing on every aspect of the design. You’d still need the expertise of architects and developers to get the job done. And compared with their typical job, now they have to satisfy the individual needs of perhaps a hundred people? It seems like it would end up costing even more. This is a great idea, perhaps it works in a design-conscious culture. Still I would hate to be the architect unless the group was willing to trust a representative PM to work with the architects. Multiple clients are a sure way to failure. i had the same thought. i suspect there was a great deal of trust placed in the architect, which, to my mind worked out great. This is what I’ve been waiting for, but I live in the US so the FTC won’t allow this. I’m not crunchy enough for co-housing, but the idea of living with friends and family as I grow older appeals to me. I hope architects and developers will see this as a way to work with the growing senior population to develop homes in cities. I guess we all need to lobby the FTC! they seemed to co-developed their building somehow. it does seem to be the exception rather than the rule however.